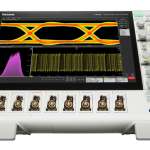 In this short episode Shahriar demonstrates an overview of the new Tektronix MSO58 8-Channel 6.25GS/s 2GHz Mixed-Signal Oscilloscope with up to 64-Bits of digital channels. The scope features independent ADC, data acquisition and memory per channel as well as FlexChannel architecture which allows each channel to act as either a 2GHz analog channel or an 8-Bit digital channel. The scope also features a brand new GUI interface on an HD 15.6″ display with significant performance enhancement and touch interface optimizations. A full review of the instrument will be provided in the future.